Climate Common Sense: UK MPs as clueless as ours! Having committed the UK to a destructive green energy path politicians there were asked how the country was going to achieve the targeted 80% decarbonisation of the economy. Christopher Booker who posed the question received replies from 47 politicians who basically had no idea of the problem. I am sure our intellectually challenged government members would fare no better. The “epic failure” of Rio, as Friends of the Earth called it, is an apt cue to recall how this leaves Britain as the only country in the world committed by law to cut its emissions of carbon dioxide by 80 per cent in less than 40 years. The Climate Change Act, on the Government’s own figures, faces us with a bill of up to £18 billion every year until 2050, making it by far the most costly law ever passed by Parliament. More important still, however, this raises the question: how do all those MPs who voted almost unanimously for this target (only three voted against it) think we can meet this obligation without closing down virtually our entire economy? This is the question which, in April, I invited readers to put to their MPs, and I am very grateful to all those who have now sent me the replies they received, from nearly 50 MPs. These, I fear, are even more depressing than I anticipated. The question put to the MPs was simple. Since we depend on CO2-emitting fossil fuels for 75 per cent of our electricity and almost all of our transport system, how in practical terms can we reduce those emissions by four-fifths? It is no good pretending that we can rely on “renewables” such as wind and solar to fill the gap, since these are so intermittent that they would require up to 100 per cent backup from fossil fuels to keep our now largely computer-dependent economy functioning. Not one of the 47 MPs who answered showed the faintest understanding of the question. Many simply relied on a form letter supplied by the Department of Energy and Climate Change, starting with the sentence: “Decarbonisation does not mean de-industrialisation.” The more honest MPs sent on DECC’s letter, others used cut-and-paste to pretend that this reply was all their own work. Some, such as our climate change minister Greg Barker, chirped about “the Green Deal, Renewables Incentives and Smart Meters”. Fiona Bruce (Con, Congleton) was “assured that onshore wind is by far the cheapest large-scale renewable energy source”. Roberta Blackman-Woods (Lab, Durham) claimed “nearly a million people now work in the low-carbon economy, with the potential to create 400,000 green jobs by 2020”. The silliest response came from Oliver Letwin, who said that the quoted costs of the Climate Change Act had been greatly exaggerated (not realising that the figures come from DECC’s own website), and predicted that solar, wind and carbon capture (as yet non-existent) will soon be so cheap that, in a few years, they “will be able to operate without subsidies”. They live in a bubble of make-believe which doesn’t touch reality at any point. Yet these are the people who passed the most potentially damaging law in our history – in the name of a delusion which, in Rio last week, died the death. Somewhere along the way, if our country is to survive, that Climate Change Act will have be thrown into the dustbin of history. Therefore, the cost of abating all of the 0.15 C° of warming that the IPCC predicted would occur between 2011 and 2020 by using measures as cost-effective as Australia’s carbon dioxide tax would be $309 trillion, 57.4% of global GDP to 2020, or $44,000 per head of the world’s population. On this basis, the cost of abating 1 C° of global warming would be $1.5 quadrillion. That, said Lord Monckton, is not cheap. In fact, it is 110 times more costly than doing nothing and paying the eventual cost of any damage that might arise from warmer weather this century. 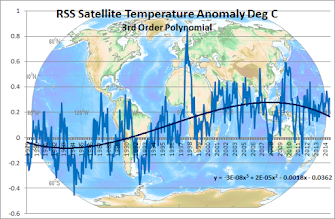 But the historic record shows that the climate is *always* changing and there have been extended periods in the past when average temperatures have been considerably higher than the latest cool period we're coming out of. CO2 is absolutely fundamental to life on earth. Without it there is no plant life and therefore no other life. There is no significant connection between CO2 levels and temperature, yet the fools label it "a pollutant". If there's intelligent life in the universe, it's obvious why they avoid this planet... it's dominated by irrational apes. Yeah, the day after we finally rid ourselves of the scourge of Egomaniac JuLIAR and her gang of Greenwashed imbeciles. Sceptics like yourselves argue that if such changes happened naturally in the past, why should any changes occuring now be due to human influence? Human-induced climate change is more immediate and rapid than past changes. There are over 6 billion human beings alive today. Coincidence? Genuine questioning in science is a good thing; it is one of the ways that science progresses. However arguing one position whilst not recognizing the other is being sceptical. Huxley also once said 'experience teaches only the teachable'. 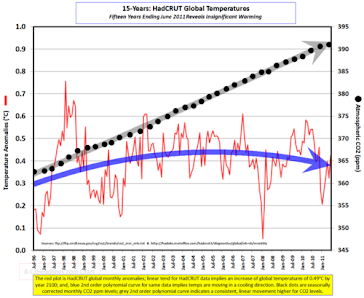 Everyone's entitled to believe Al Gore's totally discredited "Hockey Stick" if they want to. It's a free world, at least for now.